Some pieces are small, others large, but all are calculated to deceive, to lead one astray, in order to make the solution of the puzzle as difficult, as challenging, as possible. In our tradition, how a puzzle is made, and how it is solved, reveals some greater truth about the world. This quote comes from an episode in Mark Henshaw’s The Snow Kimono in which a professor of law tells a story about his father’s fascination with traditional Japanese jigsaw puzzles. It could equally describe the way Mark Henshaw’s narrative is constructed. Each chapter builds on the preceding one, enabling the story to unfold one layer at a time and bring with it ever-deepening insights and fresh revelations. The novel opens in Paris in 1989. Retired police inspector Auguste Jovert receives a letter from a woman in Algiers, where he once served as an intelligence officer. She claims to be his daughter. Back home in his apartment he finds a stranger waiting for him – Tadashi Omura, a former professor of law of the Imperial University of Japan who bears a strong resemblance to the Emperor Hirohito. Omura begins to relate the story of his own lost daughter Fumiko and his friend, the arrogant and brilliant novelist Katsuo Ikeda. As the story of a fractured friendship, lost lovers and orphaned children unfolds, Jovert cannot help reflect on the parallels with his own life which, like Ikeda’s, is built on a lie. Each strand of the narrative pivots between various characters and locations, in France, Japan and Algeria. It’s written in a slightly off-beat enigmatic style which keeps readers uncertain how everything fits together and how it will all end. Many of the tales use beautiful evocative imagery. Behind me, the mountain peaks blaze like white teeth in the first rays of the sun. Darkness seeps back into the earth. The grey-tiled rooftops of the village, clustered together like sleeping cattle, begin to surface. Banks of cloud the colour of egg white hung low and flat on the horizon. The non-linear structure and the enigmatic nature of the plot alone would make The Snow Kimono a fascinating novel but add the haunting, fluid, lyrical style and the result is the most remarkable novel I’ve read all year. From the first page I was enthralled. By the time I got to the last page I wanted to start all over again to try, like Jovert, to put all those pieces together. Mark Henshaw was born in Canberra, Australia. He published his first novel, Out of the Line of Fire, 26 years ago to huge critical acclaim. Since then he’s published detective novels under the pen-name of J.M.Calder but under his own name, nothing. Why the long silence? An interview in Sydney Morning Herald may provide the answer. The Snow Kimono is published by Text Publishing. They took on the publication after 32 other publishers turned it down. 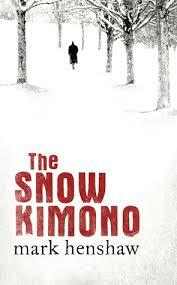 The Snow Kimono went on to win the New South Wales Premier’s Literary Award in 2015. I’ve now read two of the 2015 Booker longlist titles; neither of which I think will be declared the winner. Andrew O’Hagan’s The Illuminations was a far better novel than Anne Enright’s The Green Road in the sense it actually had a message but both were rather straight-forward stories. No real experimentation with form such as we’ve seen from recent winners like Hilary Mantel and Eleanor Catton. Maybe the judges are not looking for that especially but I would expect them hone in on a novel that has a unique quality, one that stands out from the crowd in one respect or another. Neither O’Hagan or Enright did that for me. Maybe my next Booker longlist contender A Little Life by Hanya Yanagihara will be more remarkable. It’s the early favourite for this year’s award but the judges have not always followed the popular vote so I wouldn’t put a lot of faith in the betting odds. Fortunately the disappointing experience with those two titles is overshadowed by the book I’m currently reading: The Snow Kimono by the Australian author Mark Henshaw. It’s his first novel in 25 years and was apparently rejected 32 times before Text Publishing stepped forward. It was a smart move since Henshaw’s novel went on to win the Premier’s award. From the first page I was enthralled. The novel begins in Paris in 1989 when a retired police inspector receives a letter from a woman in Algiers claiming to be his daughter. Two days later a stranger knocks on his apartment door. Tadashi Omura, former professor of law of the Imperial University of Japan, begins his story of his best friend, a brilliant but arrogant writer and the lives of three Japanese women. That summary doesn’t however do any justice to this wonderfully mesmerising tale that unfolds like a puzzle. What a shame the judges didn’t longlist this novel.